Caring for a loved one with dementia is one of the hardest things to do. The challenges and demands that the disease presents go far beyond what it takes to care for a senior without the condition. One of the best ways you can care for your loved one living with dementia is to understand the different stages of the disease. In doing so, you can better under how the disease works, how your loved one may be affected, and how to better care for them with their ever-evolving and sometimes unpredictable needs. Rather than describing dementia as mild stage, middle stage, and late stage, various scales have been created to provide a more comprehensive look into the different stages of dementia. These include the Reisberg Scale, the Functional Assessment Staging Test, and the Clinical Dementia Rating. Each of these scales divides the disease process into seven stages that are based on cognitive decline. As you’ll see below, those in stages 1 – 3 don’t typically exhibit enough symptoms for a dementia diagnosis. Usually, once someone is diagnosed with dementia, he or she is in stage 4 or beyond. Read on for a brief overview of each of the seven stages of dementia. In stage 1, the individual functions normally. They experience no memory loss and are considered mentally healthy. Those with no dementia are considered to be in this stage. This stage describes the normal forgetfulness that is associated with aging. This includes things like forgetting names and where familiar objects around the house are left. At this stage, there are no symptoms of dementia evident to the individual’s loved ones or doctor. In stage 3, the individual may experience increased forgetfulness, a slight difficulty concentrating and decreased work performance. They may also get lost more often or have difficulty finding the right words. At stage 3, a person’s loved ones will begin to notice a decline in their cognitive function. In stage 4, the individual will experience difficulty concentrating, decreased memory of recent events, and difficulty managing their finances or traveling alone to a new location. They may have trouble completing complex tasks. At this stage, they may be in denial about their symptoms and may also start withdrawing from family or friends because socialization becomes challenging. At stage 4, a doctor can detect clear cognitive problems during a patient exam. Individuals in stage 5 have major memory deficiencies. Some may need assistance to complete their daily living activities (ADLs) like bathing, dressing, and preparing meals. At this stage, memory loss is greater and can include forgetting major relevant aspects of their lives such as their address, phone number or where they are. Individuals in stage 6 often need extensive assistance to carry out their ADLs. In this stage, they may start to forget the names of close family members and have little memory of recent events. Typically, people in stage 6 can remember few details of their earlier life as well. Other noticeable changes include physical and emotional challenges. Emotional changes are common during this stage and can sometimes include delusions, compulsions, anxiety, and agitation. Individuals in stage 7 are considered to have late-stage dementia. At this stage, they will have little to no ability to speak or communicate and may require assistance with most activities including bathing, going to the bathroom, and eating. Many people don’t know that dementia is actually a syndrome, rather than a disease, where a person’s cognitive tasks, memory, and reason begin to decline. While dementia can occur as an umbrella symptom to several conditions, Alzheimer’s is the most common and well known of those. Alzheimer’s is often divided into three stages: early, middle, and late. These three stages provide an overall idea of how an individual’s abilities may change once symptoms appear. In the early-stage (which typically includes stages 1 – 3 above), an individual may function independently. They may still drive around town, go to work, and partake in social activities. Although symptoms are not typically apparent during the early stage, the person may feel as though they are having memory lapses. They may forget familiar words and locations more than they are used to. In middle-stage dementia, the disease progresses and tends to require a greater level of care. This stage can span many years and can often overlap with early-stage or late-stage symptoms. 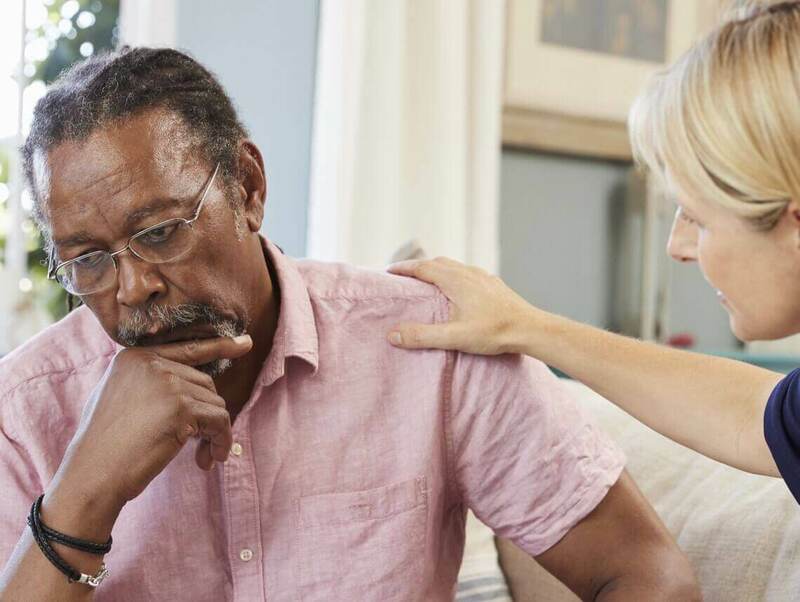 Symptoms of middle-stage dementia include confusion, mood swings, the inability to recall basic information like their address or phone number, as well as wandering off and getting lost. This stage also includes physical changes. The person may experience incontinence and may need assistance using the bathroom. In late-stage dementia, individuals lose their ability to respond to their environment. This starts by affecting their ability to have conversations and projects, to their ability to control their movements. As a person’s memory and cognitive skills decline, he or she may start to exhibit personality changes too. At this stage, they will likely need around the clock assistance. At Sonas Home Health Care, you’re never alone. We refer loving and qualified caregivers and nurses to provide expert dementia care for your loved one, from a few hours a day to around-the-clock care.